Prep Day: Whisk eggs and milk in large bowl until blended. Add all remaining ingredients except bacon; mix lightly. Shape into 6 (1-inch-thick) patties; wrap bacon slice around edge of each patty. Wrap individually in plastic wrap; place in freezer bag. Freeze up to 3 months. Prep Day: Mix vinegar, brown sugar, stock, honey mustard, allspice, and curry powder. Place in bag for freezing. Bag chicken for freezing. Serve Day: Thaw. Preheat grill pan or griddle over medium-high heat. Bring sauce to a bubble and reduce heat to lowest setting. Coat chicken with a drizzle of oil and salt and pepper, to taste. Place chicken on hot grill and cook 4 to 5 minutes, then turn. Baste chicken liberally with sauce and grill another 5 minutes. Turn once again and baste. Cook 2-3 minutes more, then transfer chicken to a platter and serve. Prep Day: Combine all ingredients but can of pineapple in freezer bag and freeze flat. Bag skewer sticks separately. Serve day: Thaw. Skewer meat and pineapple chunks onto skewer sticks. Grill until desired doneness. Discard extra meat marinade, or boil to use on cooked skewers. Prep Day: Place stew meat in freezer bag. Stir the rest of the ingredients together. Pour over meat. Close bag and freeze. Serve Day: Thaw. Cook in crock pot on high for 4hrs or low for 7hrs. Serve with broccoli and/or rice. Prep Day: Cut up chicken breast pieces into stir fry sized chunks. Put in freezer bag. Label chicken bag, frozen veggies bag, marinade jar, and rice. Serve Day: Thaw Chicken completely. Stir fry meat with a little oil in a wok or skillet for a few minutes until cooked through. Add frozen vegetables and marinade. Cook on high and stir frequently for 3-5 minutes until vegetables are heated and meat is no longer pink in the center (at least 165 F). Serve with rice. Prep Day: Cut roast into 4×4 chunks. Put meat into large roasting pan with onion, and green peppers. Sprinkle with pepper. Pour Pepperoncini peppers (with juice) and water over meat mixture. Bake at 275 degrees for 5 hours. When meat is done and fork tender, remove beef and shred with 2 forks. Turn oven temperature to arm (200 degrees). Return beef into pan, mix with pan juices, and let sit in oven for 1 hour. Cool. Freeze. Serve Day: Thaw meat and gently reheat. Place rolls on baking sheet. Place a slice of provolone cheese on each half of roll. Place under broiler until melted. Top with beef and serve. Prep Day: Cut veg and meat into strips. Place in gallon freezer bag. Mix up the spices. Put in snack size baggie. Place in gallon freezer bag, close and freeze. Serve Day: Thaw. Preheat oven to 400. Mix oil and spices. 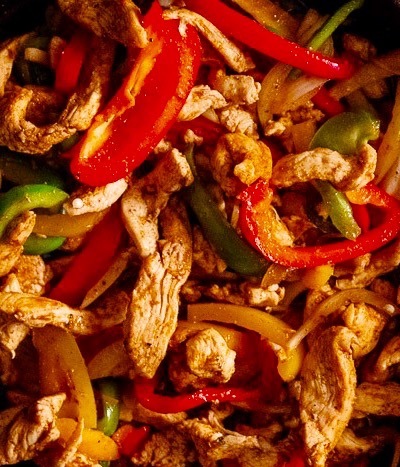 Toss chicken veggies and oil spice mix together on a sheet pan. Spread out evenly on the pan. Bake 25-30 minutes.